Before Doctor Who was a new-millennium phenomenon, it ruled the British airwaves for a quarter of the last century. And some of your grand-dad's Doctor Who episodes are actually still worth checking out. Here's our complete handy guide to old-school Doctor Who for new-Who fans. With some spoilers. Step one: Discover Ace, the Proto-Rose. The last couple of years Doctor Who was on the air in the late 1980s, the writers started experimenting with the often-boring relationship between the Doctor and his cute travel companion. They introduced Ace, a rebellious teenager with a love of explosives. At first, the Ace-Doctor relationship was just a little spicier than the traditional Doctor/ambiguous-friend pairing, but over time it became a lot more. The Doctor started putting Ace through a series of tests and forcing her to confront her fears. She, in turn, started questioning the Doctor's goals and methods more than any companion before her. The Doctor-Ace relationship provided an inspiration for some of the more fully realized companions of today, like Rose. In "Ghostlight," the Doctor takes Ace to the haunted house that freaked her out when she was a kid, except they visit it in the Victorian era and she discovers she had good reason to be freaked out. "Ghostlight" is full of weird clever touches and riffs on Victorian naturalism and the absurdity of the British explorer archetype. (And a lot of that stuff ends up being less than meets the eye, sadly.) But at its core, it's about Ace confronting her deepest fears and getting closer to being the Doctor's equal. And then in "Curse Of Fenric," the Doctor takes Ace to World War II England, where she meets her own mother as a baby and discovers that someone has been manipulating her all along. But "Curse Of Fenric" is mostly the episode steps up and starts being the clever one - there's a fantastic moment halfway through where the Doctor is counting on nobody figuring out the secret of the Viking runes. And he doesn't realize Ace has figured it out ages ago, because he's understimated her intelligence. Finally, in "Survival," Ace returns to her juvenile-delinquent roots and discovers that all her old friends have gotten sucked into a planet that's basically a weird parody of the "survival of the fittest" world the stupid adults in her life were trying to prepare her for all along. Step two: Sample the Baker era. 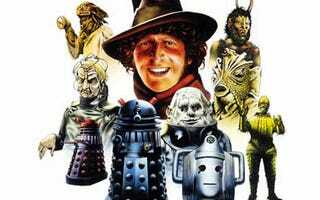 And yes, by "Baker era," I do mean "Tom Baker." I would never advocate anybody putting themselves through the torment of watching any of Colin Baker's mid-1980s tenure as the Doctor. Tom Baker played the Doctor from 1974 to 1981, and his manic (and sometimes menacing) portrayal was huge in England and won over American audiences. His portrayal degenerated into schtick after a few years, but at first he was the edgiest, funniest and most unpredictable of the Doctors. "Ark In Space." Just remember that bubble wrap wasn't as common back then, and it actually looked sort of cool at the time. And "Ark" is a classic for a reason: the Doctor is out of his depth from the moment he's trapped in an airless room with the life-support turned off to the moment he's facing an army of spacewalking giant bugs, with no way to stop them. Classic Who moment: the Doctor makes a macabre observation, followed by "I'm afraid." His companion Sarah Jane tells him to stop making jokes, and he responds: "When I say I'm afraid, I'm not making jokes." "Pyramids Of Mars." Another one where the Doctor is outclassed and overpowered from start to finish, and he keeps making clever plans that fail horribly. The interplay between Sarah Jane and the Doctor is never better than in this episode — partly because the story's female director took some of the Doctor's dialog and gave it to Sarah Jane. So instead of the Doctor explaining everything to Sarah Jane, she's figuring stuff out on her own. "Robots Of Death." Here's a clever twist: robots go around killing people, not by shooting them with lasers or firing nanites at them — but by strangling them to death with their powerful robot hands. It's a surprisingly gruesome story, by Blake's 7 writer Chris Boucher, and it explores some serious questions about humans' dependence on technology. The society in "Robots" can't function without robotic assistance, but the humans are secretly (or not so secretly) terrified of robots. So what happens when a whole gaggle of robots go berzerk and kill everybody? "I should think it's the end of this civilization," the Doctor says far too casually. "Robots" also features Leela, the knife-wielding jungle woman who traveled with the Doctor for a couple of years, and whose first response to any situation is lethal force. "City Of Death." I'm hesitant to recommend this one, because it's pretty slow going at first — the Who team managed to film in Paris, and celebrated with lots and lots and lots of shots of the Doctor running around the city. But once it gets going, the script mostly written by Douglas Adams is pretty much irresistibly glib and clever. Not to mention a cameo by Monty Python's John Cleese in his prime. Step three: Check out some other classics. 1) Don't watch any story over four episodes long. (Or about 90 minutes.) While there are a few notable exceptions, by and large the longer a Who story gets, the more it gets padded out for length. Even some four-episode stories tend to have a third episode where the Doctor is locked up for twenty minutes or gets captured and escapes a couple of times. The show's producers frequently dragged out stories for longer than they deserved, in order to save money on sets and costumes. A few possible exceptions: "Dalek Invasion Of Earth," "Doctor Who And The Silurians" and "Inferno." 2) Stay away from the black and white 1960s stories until you're well and truly indoctrinated. There are some definite gems remaining from the 60s, including the aforementioned Dalek invasion story and "Tomb Of The Cybermen," but the first two Doctors' adventures haven't aged as well, by and large, as the rest of the show. Not just because of the old-movie look of the black and white, but also because they were filming literally an episode per week, with a couple of sets, and most of the episodes have a very stagey quality to them. They're basically stage plays on film. "Claws Of Axos." For now, at least, it's the only classic story featuring the original version of the Doctor's arch-enemy the Master that's out on DVD and isn't 6 episodes long. It's got some extremely silly/cheesy moments, especially pompous civil servant Mr. Chinn, but it's also got some fun action sequences with U.N.I.T. and a somewhat clever story about gullible humans being lured to their doom through their own greed. "Curse Of Peladon." Not out on DVD, but hopefully it will be at some point. It's a fun romp about the Doctor visiting a mock-medieval planet that's trying to join a galactic Federation. The aliens are goofy and fun, and it's the only story with the Ice Warriors that isn't overly long and/or in black-and-white. "Carnival Of Monsters." Another silly romp, written by supreme Who screenwriter Robert Holmes. It drags a bit in places, due to a time loop that makes some of the characters act out the same scene over and over. But it's also got one of Holmes' classic huckster characters: a carnival con-man, who's got a machine full of captured alien races (including humans) living out a moment in time over and over. The carnival attraction ends up causing a revolution on an alien planet. "The Time Warrior." It introduces Sarah Jane and the cloned warrior Sontarans. It's also one of the wittiest scripts from Holmes, having fun with rogues and ruffians in medieval England. "Genesis Of The Daleks." Almost mentioned this in the "Tom Baker" section above. If you're up for a six-part story, this one is pretty great. The only good story featuring Davros, the creator of the war-cyborg Daleks. It's famous for having the gritty opening showing people being machine-gunned in slow motion, but it also has a lot of other great moments, with the occasional slow bit. "The Keeper Of Traken," "Logopolis" and "Castrovalva." The return of the Master, and the regeneration of Tom Baker into Peter Davison. These stories are fun to watch, and you can't help wishing that some of the touches of character development in the companions had been followed up on instead of ignored. The new Master starts out wonderful, but manages to fall apart by the end of "Castrovalva," sadly. "The Visitation." Another historical story, featuring an alien who wants to supercharge the Black Plague and wipe out humanity. Peter Davison is still finding his feet as the Doctor in this story, but he gives one of his most fiery performances. "Earthshock." The story that brought back the Cybermen and broke one of Doctor Who's cardinal rules. Very, very action movie-ish, once you get past the slow first part, but in a good way. And the new Cybermen are pretty imposing in this story. "Caves Of Androzani." Davison's last story is also his best, by several orders of magnitude. It's the return of Robert Holmes to writing Who, with one last blaze of greatness. The villains are operatic, the story has a ton of great twists, and the end of episode three is one of the greatest moments in Doctor Who. Period. "Revelation Of The Daleks." The least bad Colin Baker story is a weird satire on human mortality, set in a funeral home with more than one sinister secret. This story would be much better if it dropped all pretense of being a Dalek story, and maybe if it didn't include the Doctor. But for what it is, it's pretty fascinating. Okay, that's my advice for new-Who fans. What do you think? Ace toy photo by Decepticreeps on Flickr.